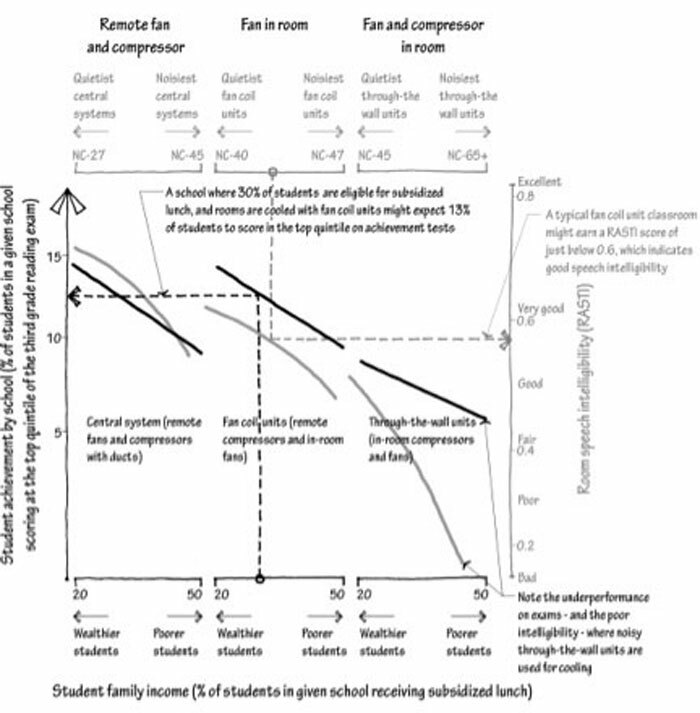 Children in schools with noisy air conditioners underperform on achievement tests relative to students in schools with quieter air conditioners. Poorer schools are more likely to have noisier systems. The teachers surveyed think it’s the kids talking in the hallway that poses the real problem – and many think there is no real problem. School cafeteria noise can be really loud – exceeding long-term OSHA exposure thresholds – but we found no correlation between noise levels and the quality or quantity of food consumed by the students. We looked for links between building mechanical system type and student achievement: the noisiest types of equipment were found to cool the schools with meaningfully lower test scores. In schoolrooms, particularly those in warm climates, the air-conditioning system is by far the largest contributor to (instruction-time) room noise. Yet some cooling system types, by the proximity of their fans and compressors, clatter more than others. Young students exposed to noise suffer losses of concentration, cognition, and the content of the class conveyed through oral communication. The problem is worse still for non-native speakers, those sitting adjacent to the noise source, and those who suffer head colds, ear infections or permanent hearing loss. An examination of 73 of the 129 elementary schools in a single Orlando, Florida school district suggests that, for schools populated with students of similar socio-economic background, those cooling with the noisiest types of mechanical system underperformed on achievement tests relative to those utilizing quieter types of systems. Additionally, schools at the lower end of the socio-economic continuum were found more likely to utilize noisy types of cooling systems. Figure 1. Test performance (black lines) and room intelligibility (grey lines) for schools with three different types of mechanical systems, lined up in three columns. The quietest systems are depicted on the left, the moderately quiet in the middle and the noisiest systems on the right. We followed that study up with a survey of the teachers who work in those same schools. What do teachers think about the noise in their classrooms, and do their impressions correlate with the type of air-conditioning system used? How do teacher attitudes correlate with the schools’ average test scores? We were seeking to track their perception of noise, annoyance by noise and approaches to noise. 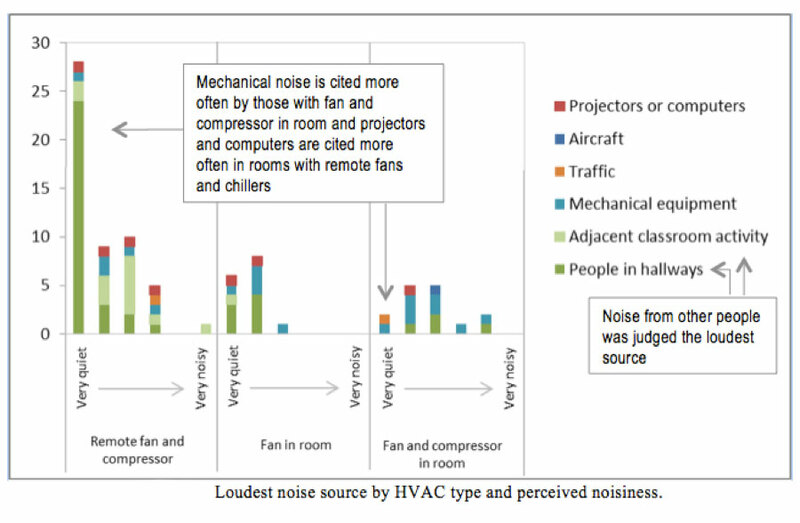 The schools with the noisiest mechanical systems were more likely to annoy teachers, and teachers in those classrooms were more likely to identify mechanical system noise as the primary noise source. Yet in aggregate, teachers were less bothered by classroom noise than the psycho-acoustics studies would suggest students are. Further, when teachers were concerned with noise, they tended to focus their ire on the kind of distracting noise associated with loud students in adjacent hallways, rather than the mechanical noise from air conditioners. Do the teachers know best because they are the boots-on-the-ground, or do they judge air condition noise from the vantage of the signal source rather than from the receiver. As an example, one man may express frustration that his housemate who is washing dishes in another room can’t hear him. After all, he can hear the dishwashing housemate clearly. In this way, he fails to recognize the dishwasher’s proximity to the swishing water and clanking dishes. Figure 2. Loudest noise source, as judged by teachers, as a proportion of overall rating of noisiness. The schools with the quietest systems are on the left, the moderately quiet systems are in the middle column, and the noisiest systems are on the right. Finally, in a small pilot study, we tracked the eating and noise-making habits of children in the cafeteria of two Virginia elementary schools over three days. Researchers on our team intercepted the lunch trays right before the children were to dump them in the trash, then separated and weighed the food intended for the garbage. We found no correlation between cafeteria noise level and either quantity or quality of food consumed (that which was not thrown away). Two compelling secondary findings emerged. First, fully-occupied cafeteria noise levels regularly exceeded 80 decibels, the threshold above which OHSA forbids long-term exposure at workplaces. Second, classes’ lunches are staggered, so a new class enters every few minutes until the cafeteria is full. At the end of the lunch process, classes gradually leave until the cafeteria is empty. The measured noise level builds as children enter and fill the cafeteria, but the same pattern doesn’t follow the emptying of the cafeteria near the end of the lunch time-window. As whole classes get up to leave, students are still accustomed to shouting (and must shout to be heard over the other students who are still shouting), so everyone continues shouting, even as there is less and less need to, because the cafeteria is emptying. These findings sit within a larger general, and growing, consensus among building researchers that people who occupy better spaces just plain do better. Twenty years ago, the increased occupant productivity linked with high performance, LEED, green, sustainable, Passivhaus, quiet, and day-lit buildings was generally backed by anecdote. A flurry of recent research, however, has consistently confirmed a once-anecdotal narrative: when buildings perform better, workers do more, students learn more and sales spike. After a substantial financial investment in a high performance building, owners can expect meaningful energy savings with modest payback times, but for buildings where occupant performance has a value, both the construction costs and energy savings are a rounding error relative to occupant productivity gains.